In a vase on Monday – in a box! Home from London on Thursday evening for a quick turn around and then an early get away on Friday morning. We were heading to Bath to celebrate the OH’s big birthday with family, staying in a lovely rental house in central Bath. Like the silly sausage I am, as well as three cakes (long story), Friday dinner and food for breakfasts, I was determined to take some flowers, and so Thursday evening saw me wandering around the garden at 10pm with a torch (in the rain), picking blooms. I got them picked and arranged in three small vases and photo’d them (above) ready for their travels. What I of course then forgot to do was photo them again gracing the very lovely dining table, laid for 10. 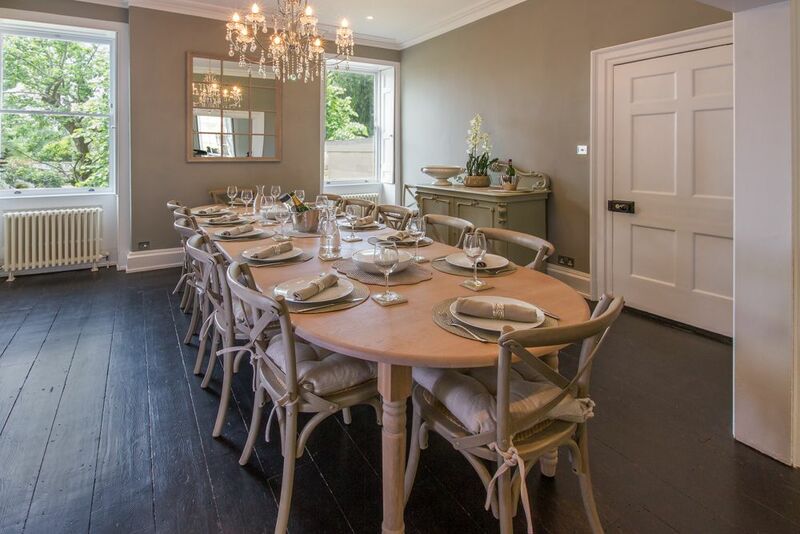 This is a photo of the table from the Bath Holiday Rentals website. You’ll just have to imagine the blooms in situ! Nothing to do with blooms, but I just wanted to share, on Sunday, as a birthday treat, I took the OH and the two ‘kids’ ballooning. I’ve never been before and we were blessed with the most glorious evening and fabulous views over Bath – including being able to spot the house we’d been staying in. If you ever get the chance, do go, it was absolutely magical. With thanks to Cathy who hosts this lovely meme. This entry was posted in In a vase on Monday, Travel and tagged Ballooning, Bath, Dahlia Happy Single Date, Dahlia La Recoleta, Helenium Sahin's Early Flowerer, Rosa Munstead Wood on September 18, 2017 by jenhumm116. Wordless Wednesday – Sunny Psyche up! I’m hopeless at staking plants, so sadly, as the wet and windy weather hit over the weekend, some huge ‘branches’ of Cosmos ‘Psyche White’ broke off, so I salvaged them for a kitchen vase. I love ‘Psyche White’. Whilst ‘Purity’ is another favourite, I think I prefer ‘Psyche White’s’ rather mad petals. To the Cosmos I added some Malope trifida ‘Alba’. I grew them from seed for the first time this year and sowed them really late, so they’ve only just got going. They are growing in the Grass Bed with the Cosmos, and these too were a little floppy – although happily not actually broken – so will hopefull bounce back once they dry off. As well as the almost blue white flowers, I love the bright green buds – such a fresh colour when so much of the green in the garden is starting to look rather dreary and brown. With thanks, as ever, to Cathy at Rambling in the Garden who hosts all our Monday vases. This entry was posted in In a vase on Monday and tagged Cosmos Psyche White, Malope trifida Alba on September 11, 2017 by jenhumm116. Well it’s all gone to hell in a hand basket – end of month view four days late – hopeless. And the photos, taken last weekend when I’d nearly run out of light, are hopeless too! Ah well, as mentioned before, I find these monthly views handy for me, so think I’ll still take you for a spin. The Mid Century bed above is looking appropriately ‘bruised’ and the ‘gladdies’ continue to make their presence felt whether I like it or not – and I still can’t make up my mind! The troughs have been a bit of a disaster this year – the Cosmos Antiquity never really got going, so I’ve allowed the enormous self seeded shoo fly plant (Nicandra physaloides) free rein as there’s not much else going on. The trailing sweet peas ‘Pink Cupid’ really didn’t like the heat of the metal trough – I suppose not surprisingly – and pretty much all curled up and died. I’d like to try them somewhere else next year, but worry that with any pot I’ve have a similar problem, and yet if not in a pot how do they trail? The Veg patch is showing off some rather more successful sweet peas than the ‘Pink Cupids’ but these too have suffered from lack of water. I’ve definitely had far more blooms from the greenhouse ones this year. As well as the blooms I’ve had the usual broad beans, runner beans and courgettes but had a terrible time germinating french beans and sugar snaps this year and so haven’t had any. The Swing Beds still have a reasonable amount of interest with the Verbena, Penstemons, Salvia and Asters as well as the incredibly long flowering Diascia personata. I shared the view over the Grass Bed as last week’s Wordless Wednesday. It really was a glorious day and the Cosmos ‘Psyche White’ have been great this year. The Perlagonium ‘Surcouf’ continues to smother both pots, and increasingly the trellis behind, to the extent where I wonder whether at some state I’ll move the Clematis out altogether and concentrate on just getting the Pelagonium to climb. Poor (Clematis) Princess Di (as it is she) seems to be as unhappy in my pots as she was in later life, but that’s a whole other subject…..
Another couple of really successful pots have been the pair by the greenhouse doors. These were another Sarah Raven suggestion and have been truly spectacular this year – Thunbergia ‘African Sunset’ with Arctotis ‘Flame’. I’m hoping I’ll be able to overwinter the Arctotis and even make some more by taking cuttings, but I’ll have to start again with the Thunbergia as it is annual. In the Greenhouse Beds I’ve had a clear out of the Nasturtiums as I’m hoping to expose some soil so the Poppies will seed. I’ve also planted out some Aster Frikartii ‘Monch’ (some of which were grown as cuttings, and some bought months ago). The idea was to increase the number in the Swing Beds, but they’re currently so rammed with plants I was worried the Asters wouldn’t get established, so thought they’d be better where I can keep an eye on them. Even if I decide to move them later, I’m sure they’ll be happier having finally got their ‘feet’ in the soil. 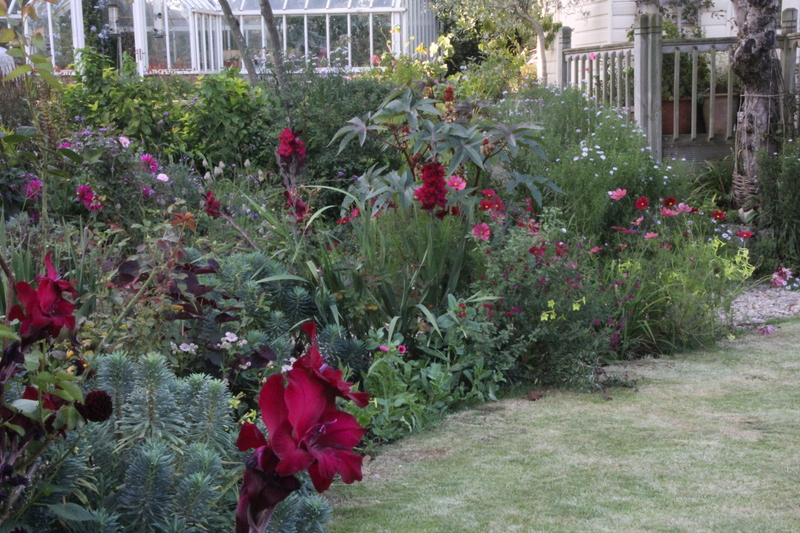 At the other side of the garden, the Dahlias and Roses are still pumping out blooms in the Bronze Bed. By the long table there have been a couple of late Wisteria blooms – but these aren’t them. These are Dolichos Lablab ‘Ruby Moon’ which I had growing in the pots by the front door which have self seeded in a pot I’m growing a Clematis in. The Clematis is taking its time to get going so these have been a lovely surprise. Goodness knows how they got here! Into the greenhouse and I’m delighted the Plumbago has bounced back from near drought induced death to be spectacularly floriferous again. And to finish, Aubergine ‘Slim Jim’. He’s a good looking lad, but I haven’t tasted him yet! This entry was posted in End of month view, Garden and tagged Arctotis Flame, Aster Frikartii Monch, Aubergine Slim Jim, Cosmos Antiquity, Cosmos Psyche White, Diascia personata, Nicandra physaloides, Plumbago, Thunbergia 'Orange and Red' on September 3, 2017 by jenhumm116.